Baja California is the name of a state in northwest Mexico. Its capital is Mexicali, which is just south of the U.S. border. Mexicali has more Chinese restaurants per capita than any other city in Mexico. 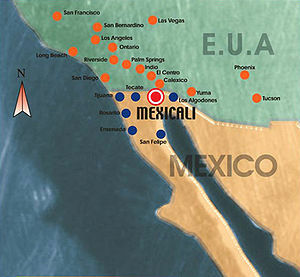 Mexicali lays claim to the highest per capita concentration of Chinese residents in Mexico. This page was last modified on 12 July 2016, at 21:36.